It's double the designing fun as we reveal two cards using the same Penny Black stamp; Red Sparkle. 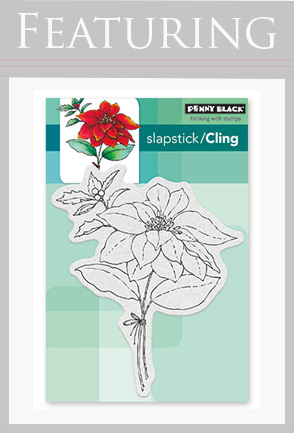 This is one of my favorite stamps from Penny Black's "Magic of the Season" collection. It is just too fun to color and paint! I began by stamping 'Red Sparkle' with VersaFine Onyx Black ink onto Canson 140 lb. watercolor paper and heat embossed with clear powder. The flower and background was then watercolored. Once dry, I tore the bottom left-hand corner and applied Distress Inks to the background using an ink blending tool and a foam pad. The script was lightly stamped using Vintage Photo Distress Ink, randomly removing some ink from the stamp with a baby wipe before stamping. I adhered a piece of text paper (inked and then stamped with Penny Black 'Footnotes') to the bottom left-hand corner of the card. 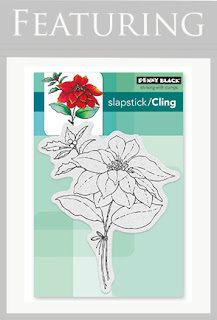 The die cut sentiment was inked with Gathered Twigs Distress Ink, adhered to the card, and embellished with small gems. Stay tuned to see how Elizabeth brings this pretty poinsettia to life!